Starting with the ominous string hits that accompany its opening title cards, it’s clear Noah isn’t messing around. Darren Aronofsky’s film aims to strip all hokiness from the story of a guy who loads a bunch of animals onto a giant ark so they can survive a flood. Make no mistake, this is a tale of violence from both humans and their creator. It is about the struggle to do the right thing, and the difficulty of knowing exactly what that is. Director Aronofsky and his co-writer Ari Handel have not perfectly re-envisioned the story—it’s probably the least-focused effort of Aronofsky’s career. But they have created a satisfying, at times stirring consideration of the Hebrew Scriptures’ themes of free will, obedience and repentance. They have introduced new characters and story elements, largely pulled from different parts of Genesis and other scriptures with a healthy spirit of reinterpretation. With the exception of some sequences that appear to be simply action for action’s sake, the additions serve the drama of spiritual grappling. Some of the new elements are practical. A visit to Noah’s magic, hermit grandfather, Methusela (Anthony Hopkins), gives Noah’s quest more of an arc (no pun intended). The Watchers, fallen angels who now live as giant rock men, team up with Noah to make the building of the ark more feasible. Magic smoke puts the animals to sleep, making the interior less chaotic once the ark is ready. While the (quite short) telling of the story in the book of Genesis contains a very specific set of instructions from on high, the movie’s Noah has no such luxury. His information comes in the form of disturbing dreams and a hallucinogenic tea trip. He understands the need for the ark and the animals, and the purpose of the flood, but is a little less clear where humanity fits in the cleansed, innocent world that the flood would create. 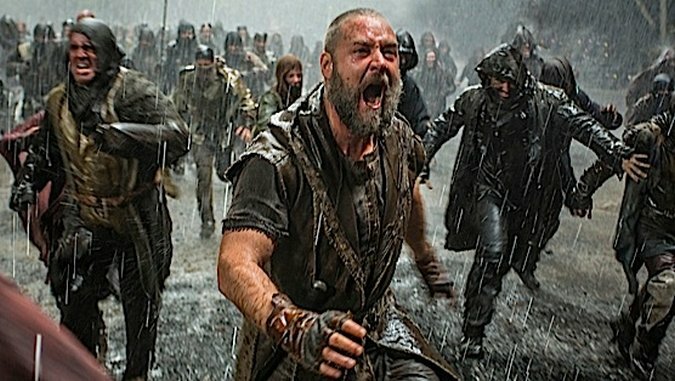 Russell Crowe plays the title role brilliantly, capturing determination, fear and, most importantly, doubt. He understands that nothing can be done to stop the flood, and that it is meant to wipe out “wickedness,” as he puts it. But he finds that he and his family, like everyone else, are not without sin. At one point, he declares that he wasn’t chosen because he was good, but because the creator knew he would get the job done, refusing to equate obedience with virtue. Jennifer Connelly plays off Crowe well as Noah’s wife, Naameh, who becomes stronger and more independent as the story progresses. Once Noah’s children grow into teenagers, the film attempts to give them stories as well. Where the Bible just gave us names (and nameless wives who aren’t present here), Noah offers noble, strong and cute Shem (Douglas Booth), his girlfriend/adopted sister, Ila (Emma Watson), the covetous, alienated middle child Ham (Logan Lerman) and young, obedient Japheth (Leo McHugh Carroll). Watson proves the most compelling performer of the group. Barren from a childhood wound, Ila lacks the means of reproduction and hence feels unworthy of Shem’s love. As the tempted, unhappy child, Ham should be the centerpiece, but his story feels rushed, making him more of an annoying dweeb than a compelling, tortured character. Finding time for flashbacks that explain The Watchers and creation itself, Aronofsky uses time-lapse and experimental photography to capture the wonder of the world and its animals. A particularly beautiful moment shows a species in the foreground of a shot change to another animal, then another, from snake to lizard and so on, with just a few frames of each, showing the amazing variety of the animal kingdom. At times, the film becomes as conflicted as the struggle it depicts, shifting its aims quickly from high art to mainstream appeal. When rock monster angels fend off an army of Cain’s descendants as they try to storm the ark, it’s hard to see anything other than cynical commercialism steering the creative process. Ultimately the personal struggles come to the forefront, making the bloat all the more superfluous. But you can’t write off the army entirely, because its leader, Tubal-cain, contributes greatly to the dialogue of blind obedience versus wickedness. Ray Winstone plays the murderous fiend not as a representation of pure evil, but as an angry man who feels that dominion over the planet is his right, and that eradicated resources are his ungiving creator’s fault, not his own. When Winstone gives his battle rally speech, it is not unlike what we’d hear from the good guys in most war films. They want to live; they want to take back what belongs to them; they want to be free from their tyrannical creator. It’s these uneasy shades of gray that make Noah such a compelling movie. Certitude is easy, and indeed it’s comforting to see good prevail while evil is punished. But when you see the horrifying reality of wickedness, yet the argument in its favor pushes some persuasive buttons, that’s when you have a dilemma to consider.